A few weeks ago I worked late on a Saturday and came home around 4PM greeted by a mish mash melange mosaic of Christmas cheer. Seems Toots and Booger bamboozled their dad into taking the holiday decorations out of the garage early so they could get a head start on fluffing our place with all manner of sparkle, glitter, and snow globe. Lordy the place glowed! With bedazzled pine cones placed in heating vents and empty corners, holly draped on couches and sills and toilet tanks, and ornaments put wherever they’d stick. Strangely, that turned out to be every kitchen orifice and cooking appliance, but no matter: The place festively bursted with decorative accents lovingly placed in bizarre and dangerous locations! Have you ever been impaled in sensitive flesh areas by a pine cone? It’s a holiday tradition over here! 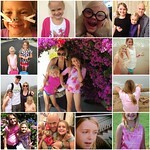 As I walked through the house and beheld each unexpected Christmas wonder, the girls trailed behind me in anticipation. “Mommy! Did you see where we put the Baby Jesus?” (On a lightbulb) “Can you find the glass ornament YOUR mom gave you as a special memento to remind you that even though you had a conflicted relationship she really loved you?” (On the third step of the staircase) and so on. And all the while because I’m a horrible OCD person unfit to enjoy the magic of Christmas unless it’s tidy, I mentally catalogued each misplaced decoration and re-located it in my head. Of course, sure enough over the course of the next several days, I’d surreptitiously transferred every ball, light, and sleigh to where they properly belonged. Everything in its place! Whhhheeeee! I’m so delightful and fun! Well after that “My OCD is going to kill us all! Alllllllllllll!” moment, I decided to let go and allow some items to be haphazardly re-placed in weird spaces. Which is to say, that around MY home, holiday decor is all about me being able to live with my kids’ version of holiday decor. But right? It’s messy religion-wise. Sending mixed signals. A Jesus holiday trinket on Buddha? Come ON! According to my children. And let me tell you, as a certifiably insane over-vacuumer, THAT is the hardest thing to let stand. Or sit. Or lay? What IS it doing? Scattering its infernal messiness all over my white carpet? 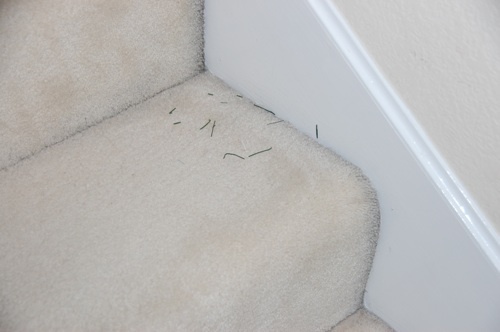 DIE pine needles DIE! DISINTEGRATE INTO NOTHINGNESS! STOP DEFILING MY OCD SPACE! Ha. HA. I kid. Just. Kidding. Kidding is me. Call me a kidding person. Of kiddingness. I’m cool, really. Cooooolllllll. At least the Made in China figurines are arranged from lowest to highest. All this is to say I’m trying to win a vacuum. (“I am sharing my holiday home decor and cleaning tips for the chance to win prizes from The SITS Girls and Great Cleaners.”) Because if I had a new vacuum, I could busy myself with sucking dirt up and not worry so much about Buddha’s bow. 1. Use vinegar and baking soda on everything. I do. I pour it down the sink, in toilets, and on carpet stains. It makes a little cleaning volcano that sounds clean while it’s cleaning. I like things to be clean. CLEAN clean. With cleaning. 2. Let some things go. Like your entire upstairs and the insides of things. This cleaning tip can get complicated if you use your second level or refrigerator. 3. Get a new vacuum. Because the one you have is full of disappointment and defeat. I think that’s good for now. Because I don’t care to dissect why I’m gunning for a new vacuum when I just wrote about why I needed to de-OCD myself. So: Merry Christmas! 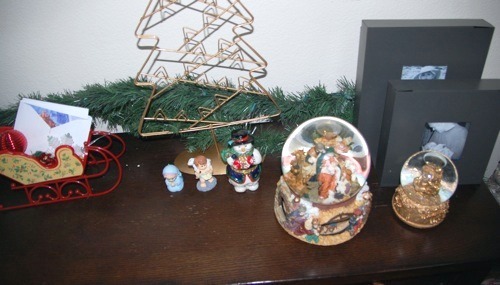 Enjoy, even if your holiday figurines are placed asymmetrically! I don’t even have OCD and these things drive me nuts. I let go a wee bit and let my 3 girls decorate our tree with their Barbies. But on the inside, it’s killing me! As a fellow OCD holiday decorator, I get this. I really get this. 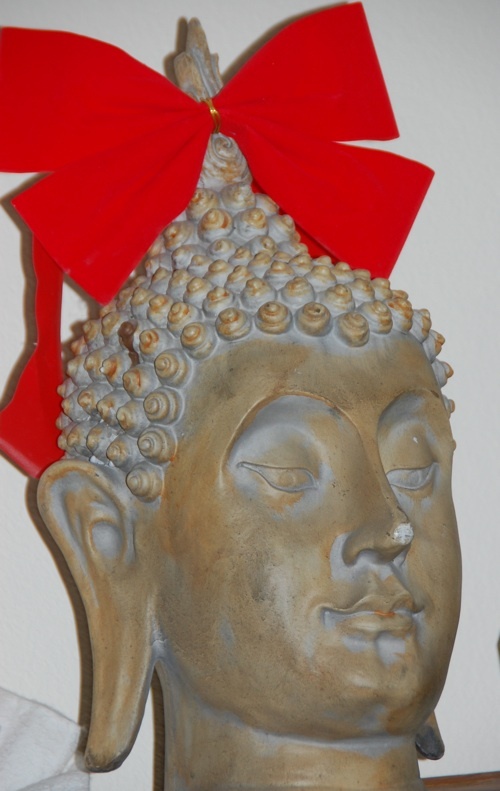 Oh, and it’s totally OK to put a Christmas bow on Buddha. He’d be totally down with it, you know? OMG. I also came home to find my family doing some unauthorized decorating. It. Was. A. Nightmare. I feel your pain. 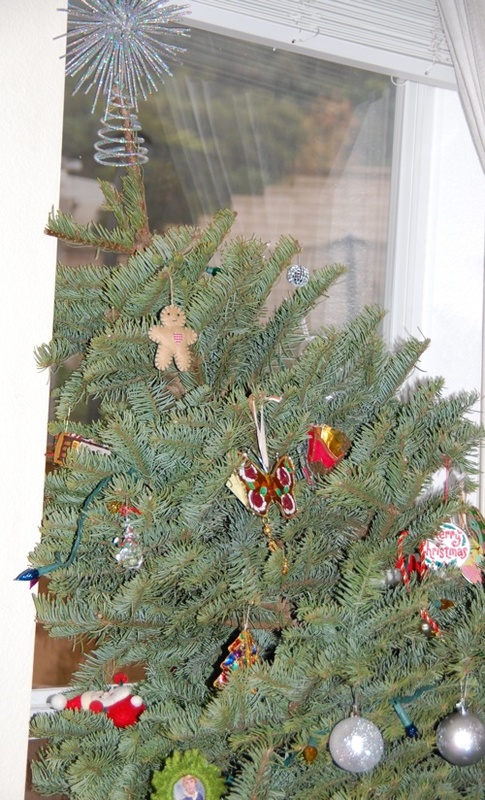 Let us know how the tree turns out – it’s causing me distress to know it’s tilted like that. p.s. I can’t believe you have white carpet with kids in your house. Oh my, a teeny tiny bit of my OCD-tendancy heart is dying for you right now. Hang in there, Mama! This is why there is chocolate! I love you. This made my day. You dare to say the things we’re all thinking. The reason I connect to this blog: “I’m someone who needs stuff to be aligned in a sensical fashion (note: only in my house, not in my head)…” If I close my eyes I can see how I would like my house to look at Christmas time. But I eventually have to open my eyes…. I’m so glad to know I am surrounded by support and love during this difficult time. Oh yeah–I have the same OCD, but I find it’s either fading a bit as I age or my kids are growing used to it and accommodating my NEED for order. Just HATE it when the tree tips over though. Love, Love, LOVE the bow on the Buddha! Incredibly festive! Okay, love the sprinkled needles on the step. That is absolutely something my kids would do and have done. And the red bow on the buddha?! That is hilarious! A cleaning volcano sounds too cool not to try out.